More than a decade ago, there was a tourist project in Finnish Lapland with a focus on Santa Claus. The project created a Santa’s Road between the tourist destinations in the area. The projected ended many years ago. The Santa’s Road included much of E-75 that has a leg between Rovaniemi and the northern most part of Finland. The distance from Kaamanen to Nordkapp is not long. The idea of extending the old Santa’s Road to Nordkapp from Kaamanen was conceived. 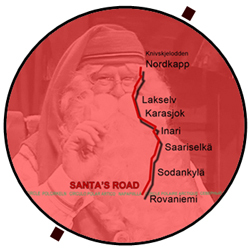 In 2014, a project called Santa’s Road between Rovaniemi and Nordkapp was born. A few years ago, I stumbled upon something by the name of the Midnight Sun Road. On a visit to the tourist information in Jokkmokk I was given a bunch of A5 sized postcards depicting this road. In 2010, the work to rejuvenate the Midnight Sun Road between Piteå and Nordkapp started. Last summer we did the Diamonds of the Arctic Tour 2014. The purpose of the tour was to write blog post and to create film clips about what is along the Santa’s Road and the Midnight Sun Road. In addition, some Bonus Diamonds was also covered. The film clips are being edited. It was a fantastic journey. The weather was more fantastic. And the people we met most fantastic. In particular, I would like to thank Ms. Marja Jalkanen and Ms. Sanna Kärkkäinen in Rovaniemi. The beauty is in the details. I do not want to write standard destination promotion copy. I find it more appealing to find the small diamonds, the twists and the big picture. On the tour the idea was to produce two-three blog post every day for a busy fortnight. On the first two days in Rovaniemi, we had material for at least eleven blog posts. This would be the average for the rest of the Diamonds of the Arctic Tour. The roadumentary of the Santa’s Road started in a highly contrasting way. On the first morning, we had scheduled a visit with Mr. Santa Claus before office hours. Santa Claus is Love. The next thing we did was to visit the cemetery of fallen German soldiers during WWII. War is hate. This is symbolic to the range of topics along the Santa’s Road. Do You Collect Stamps? Visit Santa Claus Post Office! All of these blog posts are written about experiences between Rovaniemi and Nordkapp. Some of them are short detours of the main road. Others are short of correct memory, unwilling and willingly. The second part of the Diamonds of the Arctic Tour 2014 relates to blog posts along the Midnight Sun Road between Nordkapp and Piteå. The third part are diamonds in the triangle; Luleå, Muonio and Rovaniemi.